This thing is really happening, and it might even be awesome. 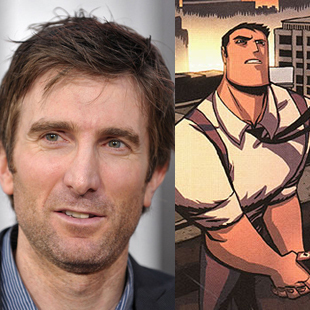 Sony's television adaptation of Brian Michael Bendis and Michael Avon Oeming's police procedural/superhero mashup Powers finally has a complete lead cast, as it was announced today that Sharlto Copley (District 9) and Michelle Forbes (Battlestar Galactica, Orphan Black) will be joining the series. Copley will play Christian Walker, a veteran homicide detective who was once a superhero called "Diamond", until he mysteriously lost his powers. Forbes, meanwhile, will play the superhero Retro Girl, described as "[having] a cool and hard exterior with a fire right below the surface. The character is the undisputed super star of the Powers community who is an icon of justice, selflessness and business acumen. " In the comics, (Spoiler, highlight to view), Retro Girl is murdered in the very first issue. The investigation of her death makes up the initial storyline; while several of her known arch enemies are initially suspected, it is eventually revealed that she was killed by a deranged fan, a point that sets up the series' exploration of how the existence of superheroes would impact popular culture. The casting of Michelle Forbes*, an actress well known for preferring short, season-specific stints on television, suggests that the first season of Powers will likely follow that storyline. So far, casting for Powers has been refreshingly free of slavish devotion to the aesthetic established in the comic. Last month it was announced that The Following's Susan Heyward will be playing detective Deena Pilgrim, diverging strongly from the blue eyed blond of the comics. With the casting of Forbes and Copley, it appears superheroes in the TV series won't have the same kind of vaguely eternal youth as their comic counterparts. Given the hell these characters go through over the course of the series, it's a good choice. Powers is part of Marvel's Icon Comics imprint, which exclusively publishes creator-owned titles. * (Spoiler, highlight to view), Sadly, this means we aren't likely to get a flashback to Walker's superhero threeway days.